Do you work for Eventbrite? Eventbrite is a ticketing and event technology platform that helps businesses organize and sell tickets to events online — while helping people discover events that fuel their passions. From workshops to concerts to conferences to world-renowned film and music festivals, Eventbrite houses events of all shapes and sizes. Eventbrite’s powerful platform, which can be accessed online or via mobile apps, scales from basic registration and ticketing to a fully featured event management platform. Event organizers can benefit from Eventbrite’s self-service event planning tools including email invitation creation, RSVP tracking, and ticket selling. Ticket sales can be managed online via the ticketing website or through integration with social media sites including Facebook, and real-time sales data helps event planners to assess attendance and profit. With powerful discovery channels, robust marketing tools, and industry-leading conversion rates, Eventbrite can help you zero in on the most interested event-goers and sell more tickets to your event. Learning about Eventbrite? We can help. "Super robust event management platform"
The aspects of the Eventbrite platform I like best are the tracking links, which enables you to track the source of registrations, and the app's event check-in feature, which allows you to check in event attendees from your cell phone. It would be nice to have more creative control over the design of event info/registration pages. Currently it only allows to edit the page header and the body copy. I'd love to be able to have more flexibility with it. The free version is still an excellent product (it's what we use) so at minimum it's worth a trial run. It's super easy to use and offers a ton of awesome functionalities, even at the free-to-use tier. We use it for events of all sizes and have never had any issues whatsoever. We use Eventbrite to manage our internal and external events, from start to finish. It's excellent as it allows us to do everything from track registrations to run reports to check-in attendees all from one platform. Previously our process was segmented between various applications and required a lot of manual work. "Best way to keep your meetings and advertise"
I love how Eventbrite has helped me as a mom plan my events and also keep tabs on events we have been invited too. It syncs up to my iPhone and is easy user-friendly and colorful. If you are looking for a way to give ease and peace of mind, Eventbrite is your platform. easy to use, easy to navigate and ahead of the game. My favourite thing about eventbrite is the mobile app. Since I am an iPhone user, I am able to save all of my tickets to the wallet on my phone rather than having to print out the tickets and keeping track of them. I used to have to print out my tickets for each event that I was attending and carry each ticket individually. Now I can just easily download them to my phone. There's little customization on the eventbrite pages themselves and marketing integrations to be able to tie it more into a larger marketing campaign and plan. We use eventbrite to create event in our business. The events are sometimes reserved for our clients and sometimes they are public. Sometimes they are free, sometimes they are not. We need to have an app that is flexible to meet our needs. "Timely Update and Quality Guidance on Events"
I would not say I have met anything negative about this provider, because, I usually get what I really need when, where and how I need it. Easy and efficient way to plan your get together is clearly on this platform. So give it a try and you will get used to it. It is considerably automated and the steps of events update are quite easy. I have used this platform for mainly refreshment and for our team to schedule an off-office time get together. It actually saves us the strength to start planning new events; rather we just get a hook up with what that is already there and plan our trip from Pune city down to mostly Mumbai. We use it to plan a new event as well, such as when we want to create an easy push out notifications to all our employees (colleagues) and makes it easy for everyone to know, where and when we are going to events. "Eventbrite is the essential tool for those who are essentially "doing their own thing""
What I love about Eventbrite is how user-friendly it is. It's extremely easy to create an account and create and manage events. I think Eventbrite is perfect for people who work in small, startup-type operations, entrepreneurs, and other groups who either don't have an established event management platform, or would rather opt for the simplicity of Eventbrite over in-house or more complex platforms. Another bonus - being able to easily style your event landing page - just upload a photo and Eventbrite does the rest! It's hard to find something I dislike about Eventbrite...I actually think I have nothing negative to say. Before you are ready to launch your event, be sure to have a picture in mind that you would like to upload to your page, as this will help style your event page. Event management for attendees who are outside of our regular event management system (ex: I work in higher education so sometimes we will use this platform for our alumni events, since most alumni don't have access to their school email addresses anymore). I love that I can make an event in less than two minutes! We host job fairs all over the country and using eventbrite helps me market my event to the local areas. I can also add an image which is also helpful. Helps us show our brand to people searching other job fairs. My most favorite thing about eventbrite is that if someone wants to register for a certain event, I will personally get notified with a person's name and email address. No other event website can do this! The only complaint I have is that when I receive information of someone who is interested in attending our event, we are provided a first and last name and email address but no phone number. In some cases where I get invalid email addresses it would have been nice to also get a candidate's phone number as another way to reach out to them. Using Eventbrite creates another avenue for me to reach out to the public in certain cities and let them know about our job fairs. The biggest benefit is receiving email addresses of those who register for certain events. "My first choice for event RSVP's"
My favorite part about Eventbrite is the way it makes my event look so incredibly professional. All you have to do is plug in a picture, enter your event information, and voila! You have a beautiful page that displays your event in a professional manner. Especially the map feature... love! I wish it was easier to get the link out to people. It seems easier to just make a Facebook event, because people are already logging into Facebook as a social media. Many people aren't accustomed to going to a separate website to RSVP. I don't think that's anything that Eventbrite can change, though – just a thought if you're considering using Eventbrite for your event. Your event will look amazingly professional and you will be able to track RSVP's like never before – don't go back to using pen and paper or email or phone RSVP's! This is so much easier now that we're in a digital era. Eventbrite helps us keep an eye on our RSVPs for some of our big banquets and events. We get the information of the people that sign up and we are able to use that to coordinate things for our events. I love that Eventbrite is customizable because I can add text fields to acquire additional information from attendees. "Organize and Promote Events with Ease"
Eventbrite is a great tool for small to medium size organizations who need to set up an event. Once the event is created is is super easy to share, promote and keep track of sales. I love that I can use the software from my laptop as well as my phone using the Eventbrite organizer app. Setting up an event can be tricky, especially if you are trying to set up more than one type of ticket, and it takes a little bit of time to get through to customer service if you need them. Don't be intimidated, it's actually quite easy to use. We have used Eventbrite for 6 years to set up an annual event, and once we got past the learning curve on that first setup it has been smooth sailing! I love being able to login from anywhere on my phone and keep track of the ticket sales. "Much more professional than Facebook event pages"
It is an easy way to share information about and collect RSVPs for an event. It easily integrates with platforms like Facebook (use the link in the ticket section of a Facebook event) but looks much more professional when sharing via email. You can also export the information collected by registered attendees and duplicate or set an event as reoccurring for events that are part of a series. Finding information on the backend is not always intuitive. This is great if you do not already have an event page on your website but need to direct people somewhere for more information about an upcoming event and collect their information. Consider the cover image proportions when making marketing materials as typical flyers are not a good fit (we typically do two versions - standard flyer or handout and then a cover image for Eventbrite/Facebook). Also note that there are charges if registrants need to pay for tickets. Collecting information for registrants at events to speed up the registration table at the actual event and ensuring that information is complete/correct (not necessarily the case with paper Sign-in sheets). Super easy to set up an event. The user flow is also fast and reliable. Prices have crept up over the years making me take a second look. I also hate that you cannot completely white label your event, even when employing the widget. Everyone knows you're using Eventbrite. It's also not a complete solution. It's fine for ticketing, but if you want to set up a simple event web site you have to go elsewhere. The reporting features are also somewhat limited. Think about all the features you need in an event management platform. Can be tempting to rush in because getting started is so easy. Sometimes that's the most important thing, but sometimes you get boxed in. Getting people to sign up for events. It's very nice that there's no fee for free events. Glad they've kept that. Google forms for external programs are so tacky. "Free platform for nonprofits to utilize "
"Great event tool but high fees"
I dislike the extremely high fees that Eventbrite charges when you have a paid event. They have a fee for using their platform to sell tickets and then on top of that they take around 10% of actual ticket sales. If you are just starting out running event and want something more robust and trackable than Facebook then I definitely recommend Eventbrite. However just be aware of the fees you will be paying when using it for a paid event. We have a lot of company events to help us recruit more talent as well as pick up more clients. Eventbrite gives us the analytics to know what numbers we need to hit as far as tickets sold, pages views, and ticket source. It has also been essential to building up our database for future events, and email marketing. "Great tool in a very specific niche"
Very easy to use. Customized to local flavor (I am in Argentina, and it it not only translated into Spanish, but also features some "Argentine" words). Comprehensive. Has lots of tools that are very useful if you are organizing a massive event. The seating tool has some complexity, it is not intuitive. It is not easy to search for events, because people don't post them always in the right way. The payments are a bit tricky, but hey, this is Argentina! Things are not easy here, especially in all things related to payments. Try it. Might be not so friendly at first, but this is a great tool for events. The payment platform is a great resource if you plan to sell your tickets online avoiding the hassle of having to contact all the attendees one on one. The seating map needs improvement in my opinion, but there are other online tools that you could use to overcome this small flaw. Overall, I recommend Eventbrite. It might seem a little disappointing at first, but they are working hard to improve the platform and truth is there are not so many similar apps in the market. In Argentina specifically, this is the only one available for events. Collecting payment for events. This is a great tool, very easy to use for both the organizers and the attendees, has an App where you can download your invitation and additional info on the event. The integrations also work very well. It is a great companion to any event. I love that eventbrite is easy to use and that you can add different roles to the events to give others access. It's also nice that you get some customization options, even without paying. Unless you have a premium account, technically your event page is public and anyone can register. We have ueed Eventbrite for multiple events and almost every time, we have to screen RSVP's to make sure they are people that actually are supposed to be invited and email them to make sure they aren't random people. We have had random people show up to the event because the page is public. 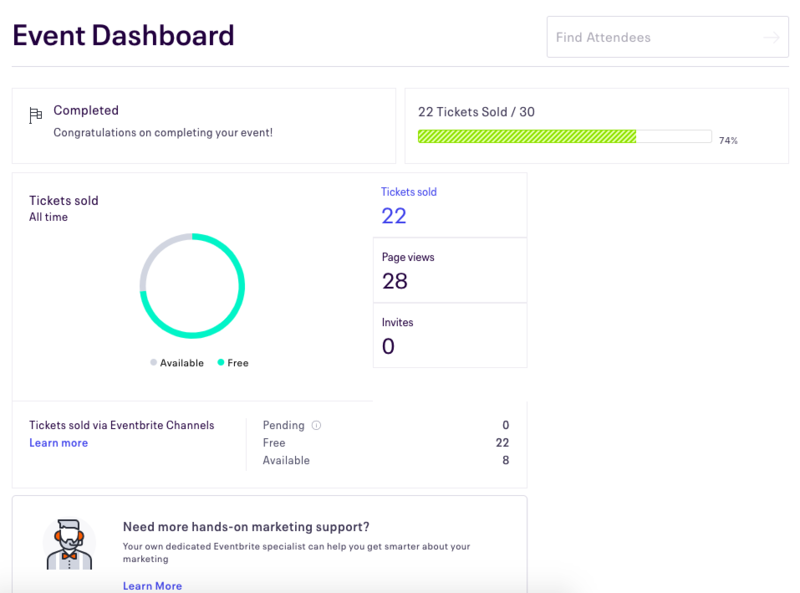 We needed a streamlined way to allow people to follow a link and register for an event quickly and allow us to communicate with all attendees at one time and Eventbrite was a great platform for that! "I easily find professional meetups around me." Eventbrite has a user friendly and intuitive user interface ,which makes it easy to signup and register to attend events via the Eventbrite platform.While I have used Eventbrite to register for a few official events ,I use Eventbrite majorly to find social gathering and networking events happening around my town during weekends ,when I am most likely to be bored and less busy. I have nothing negative to say about Eventbrite . I have used this platform for over a year and the experience has been satisfactory. 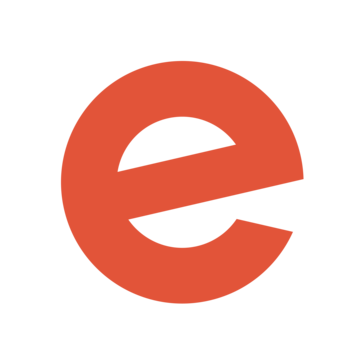 "Eventbrite - Nice application to find events on your region or create and manage your own"
I really like eventbrite because of the user base that has. You could find a lot of events near the region that you live in or are visiting. This lets you take advantage of your future travel plans and business needs. You could also create and manage your own events in a fully graphical and easy to use interface...no hassle or complicated training for you to setup your event. Access to the mobile app is pretty awesome because internet browsing tendencies shows that people use their phone a lot more that their desktop/laptop computers to browse. Mobile app is pretty cool because with ZERO effort you can find events near your area and you can filter listings by your interests. Wonderful User interface and easy to use complete the experience of this wonderful app. Eventbrite is fully deploy on US cities but when it comes to Latinamerican cities, only big cities have events on the platform. I guess eventbrite needs to make some extra effort to incentive more users to upload their events in latinamerican cities. Use Eventbrite when you are looking for events all over the US or capital cities in LATAM countries. Eventbrite is also pretty handy to create free events. Find interesting business and PR events for our company to go to. Help spread the word in some events that we are organizing. "GO paperless with Eventbrite! " I like Eventbrite's non-profit rates, I like how easy it is to set up events, how easy it is for multiple users to sell tickets using the mobile app, the detailed reports available in Eventbrite, the ability to create discount codes, and the ability to check people in WITHOUT asking them to show their printed tickets. I dislike not being able to use Eventbrite for point-of-sale transactions like concessions (they charge a $1 fee each time you sell an item for concessions!) and I dislike the lack of flexibility to offer one ticket type for 1 day of a multi-date event. If you choose to make a ticket type visible to the public, it's visible for ALL days of the event. Sign up for an account and get started right away. Contact customer support with any questions you have - they are very responsive and very helpful! I have not been disappointed in 5 years of using this product. More cost-effective ticket sales, better reporting, better real-time tracking of ticket sales, mobile application access, and better communication with our patrons. "Good way to manage your event"
With Evernote you can set up your event in minutes and sell ticket with no pain. It's easy to create different tickets type, set up promo code to share with links and to manage the attendees list. Also the check in phase is facilitate by the app that Eventbrite provide you. It's also free for free entry event and have discounted fee for non profit orgs. In Eventbrite the design customization it's not so customable. Also Eventbrite can be a little more expensive than other platforms with the same services. But I love the solid look and services. The customer support it's not one of the best out there. I test out many platform on ticketing and managing event. Here in Italy it's one of the best. Eventbrite helps me to save time in the events that i organize with my team. We find uselful the attendees list that have all the informations about them, from emails to telephone numbers. "Simple & Easy to Use Ticket Platform"
How easy it is to set up an event, brand event landing pages and send out reminders to guests. Event registration questions can be customized, which makes asking questions like 'how did you find out about this event' really easy and seamless. I wish the reporting aspect was more robust and integrated better with mailchimp, hubspot and even Google Sheets. I wish it had a complete database of all attendees to any event you've hosted and could quickly tell if they were a no show, how many other events they attended, etc. I'd like to see options to tag customers in the database as clients or non clients so I could get an overview of the event and know right away how many clients vs. propsects attended. Right now, I do all this manually and feel like there should be a way for better reporting. We host classes each month to teach business owners in our community about digital marketing. Eventbrite offers a very easy, very low cost solution to promote these classes. Eventbrite is solving our ticketing and registration problems and eliminating the need for us to do this on our own website. "Eventbrite helps to organize your event"
From Eventbrite I really love the way you can complete manage your event's attendees. Your guests can book and receive in their email tickets and instructions for the event. Also provide you the free app for your smartphone that you can use for the check in. 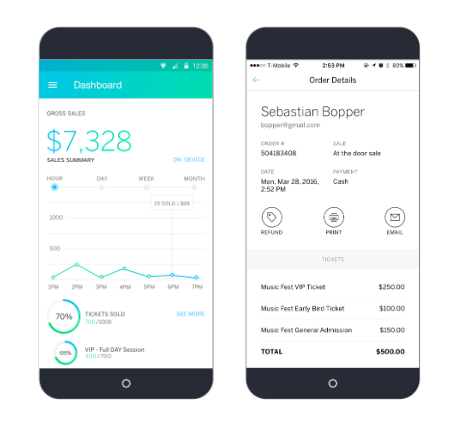 The same app is paired with the online platform with wich you can control real time the guest attendees arrival. Also is free if your event have a free entry. Eventbrite it's a bit expensive than other platforms that provide you almost the same services and tools. But I've to say that Eventbrite appear more organized than others. Even if Eventbrite is expensive that other platforms with same services, I higlhy reccomend you to test it out, even in the free version with free entry events. In this way you can really understand the value of this platform and the easy of use. I used Eventbrite often in the last months for a couple of non profit events and a couple of free entry cultural events. With the website and social media integrations was very easy to sell or let book the tickets with easy. Also managing the event before the opening was really simple with smartphones or printed attendees list. "Eventbrite is a great website for broadcasting and managing events." Eventbrite is very easy to use whether you are making an event or purchasing tickets for one. The format is very easy to plug in information. Eventbrite also shows analytics like how many people visit your event page and where they were directed from. Tickets can be hooked up to Facebook events so that people don't even have to leave Facebook to purchase tickets. Email confirmations are sent to both purchaser and event host which leads to good tracking and well-kept records of attendees. I don't dislike anything about Eventbrite. It's a great website and it's free. Eventbrite makes the entire process very easy for hosting and selling tickets for an event. You are kept updated with emails, and there are lists available for registration for events. Eventbrite also shows analytics like how many people have visited your event in a period of time. It makes selling tickets for events a lot easier and more organized. It's better to keep track of everything. "Eventbrite for Non-profits and Religious Organizations"
Eventbrite is very customizable and easy to use. We use it for both paid and nonpaid one-time events and ongoing events. It allows us to collect needed info and payment from hundreds of people. It provides great tracking for accounting purposes. We are a non-profit and thus receive a discounted rate, yet the rates are quite high, with a charge of $1.99 per paid ticket and 2.5% of the total cost as well. This does have to be taken into account when budgeting for events. We primarily use Eventbrite for unpaid and paid events at our organization, whether it be various classes and ceremonies that we hold, or studies, dinners, events, etc. It allows much less administrative work and data entry on our side and allows our attendees to sign up for events at home, during their own time. It allows them to pay for events by card, rather than only cash. We can run events as large as 1,000 people for our Christmas party, to as small as a study for ten or twenty. This versatility is key. It also allows us to communicate more info about certain events then we can in a handout or verbal communication, due to time constraints and the attention span of our audience. Eventbrite handles everything from event webpages, online and at-the-door sales, contact management, social media promotion, post-event surveys, and more. Free for free events, and if you opt to pass the fees on to ticket buyers, free for paid events too! A few quirks here and there cause a few hiccups in an otherwise speedy event rollout (ex. Having to manually set the ticket sales end date for each ticket type). Be sure to inquire about their lower fee structure for nonprofits if you are an eligible organization. Also, check out the "Broadcast" integration with Evvnt to get your event listed for free on a number of networks. Event management was a headache. Different departments had different processes, different ways of handling ticket sales, online registrations were tracked on a different ledger than at-the-door payments for the same event, and so on and so forth. Eventbrite fixed all of that; centralizing all of our data and providing a much improved experience for both guests and the folks running the show. "Eventbrite has always been a reliable partner for our events." I have been on both sides of this platform. ; as an event organizer,I have used Eventbrite to plan events and as an event attendee,I have also used Eventbrite to buy tickets to paid events,and also to register to attend free events. I have stumbled on events on this platform and found it very difficult deciphering what the event was all about.Will be a great addition if event organizers are manadated to provide a good description of their events. I use Eventbrite to plan our monthly free movie viewings at Iroko Tv.Making it easy for interested movie lovers to reserve a ticket to the event for themself.This is obviously a more effective means to allocate tickets to people ,than they having to send my organization an email or having to visit service outlets to pickup tickets . "Eventbrite let me find the right events for my research." Eventbrite is easy to use,and I like using the mobile app. as against accessing it from a pc or tablet.The good part is the quality of experience on the Eventbrite mobile app. is at par with the experience on desktop computer. I like the ease of payment for Tickets on Eventbrite and the fact it accepts my local interswitch payment debit card is just awesome. I think some of the listed events on Eventbrite ,can be a little more descriptive with their events. There are event listings I have encountered which I was not really sure what they were all about. As a marketing analyst,it is my favorite past time to get to meet consumers and major players in my market of interest and get their views ,insights and opinions on trending market issues. Eventbrite enable me do this ,by letting me find and register for random events in my industry of interest. The best part of this is that I get to register for this event ,for free : on most occasions. "Eventbrite has helped me grow my professional network." As someone using Eventbrite to register and buy tickets for events,I find Eventbrite very intuitive.Over the years I have relied on Eventbrite to find an occasion to attend on days when I am less busy.More importantly Eventbrite has a mobile app. That allows me download my ticket events as a digital copy,preventing from having to go around with a piece of paper in the name of a printed ticket. I will like to get notifications about events taking place around my vicinity,which I may be interested in.I think Eventbrite should be able to leverage on my past activities on the platform,to predict the kind of events I will likely be interested in.While I am not a software engineer,I know this is very possible. Personally,I use Eventbrite to find local networking events where I can meet professionals like myself,thereby improving my professional network.My organization also uses Eventbrite to organize monthly events where we bring together movie fans to watch select movies over the weekend at Iroko Cinemas for free. "Eventbrite Gets the Job Done"
From a business perspective, it stinks that I can't customize the emails I want to send through Eventbrite. I know they allow you to send emails from their platform to your guest list, but it doesn't have our same look and feel. It would be nice to have a more customized experience in that aspect. Because all our events are free, Eventbrite is free for us. Eventbrite has taken the hassle out setting up events through more complicated systems that are on the market. Benefits are that everything doesn't have to be complicated all the time - event marketing is easy. "Functional but can be annoying "
I have used eventbrite quite a few times to purchase tickets for events. have also used it to plan events for my nonprofit. I like that it's free if your event is free. I also find it generally quite easy to use which is nice. if you're looking for something to do, it's great too. If you know what you like and you choose your interests accordingly, the recommendations are always spot on. It's hard not to find something that would interest you and there are always lots of free events. Sometimes I find it a little unclear what the event is actually for however. I know this is a problem on the part of the organizers, but perhaps they could be prompted by the software to be a little more descriptive. This is only an issue when I'm purchasing tickets for an event, not when I'm planning my own event. I think it is a very functional platform if you are looking to plan an event for your organization! I would definitely recommend it. I don't think I've used it enough to really see its flaws though I am sure there is room for improvement. I use it for my Fulbright association programs. It just streamlines things for us - it is easier than dealing with a million RSVPs over email. It's more simple and straightforward to have people just RSVP for our event on Eventbrite. I find it makes things much easier! "Organizing events beame SO much easier"
My personal favorite option is the ability to check the tickets by using Eventbrite application. No need to search the attendance on long lists of reservations - simply check the ticket and you have all the information needed. Managing events might be a tad easier. Some of the options are really deeply hidden and need some more clicks to get to them. 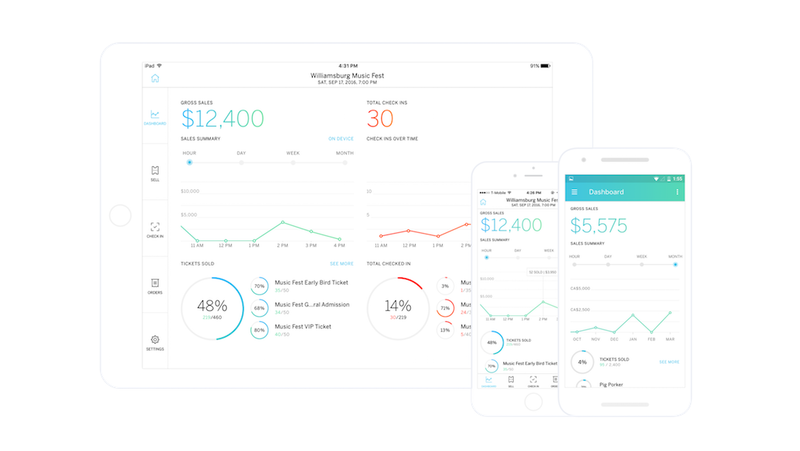 It's very developed SAAS and probably has all the options you need - just a bit hidden. You may want to try it first by registering a ticket to some free event. We certainly have more time and less stress while organizing our events. No more incomplete lists of guests, chaos regarding waitlists and so on. Everything is kept in one place and conveniently sorted for further analysis. This is a great place to manage events, track registration, use mobile devices to make the on premises registration easy and fast. Also, you can have a page for the event, sync with social networks and add all the information, even the speakers! There are extensions available so you can download your data, or add other features to it! There are a lot of good things but, with big events, sometimes there's a need to bulk add some attendees, or the staff and it's possible, just not friendly enough. It would be awesome if some csv or xls import was available to admins. This is a great tool to manage events in general, from ticketing, to on-site registration. Eventbrite is being use mostly for event management, we offer training, conferences, symposiums, etc. So attendance is a big deal. Previous to Eventbrite all of our events registrations were done manually, now we can automatize the check-ins, use mobile devices to make it easier and faster, use other tools such as social networks to promote te event, etc. "How else would you run a ticketed event?" Most people know eventbrite, so they're aren't afraid to put their details onto the site to get their place at your event. It is a highly customisable site, so the event can be very much paid out as you want it to be and the data captured exactly what you need to capture. I use the search function to find events nearby that I'd enjoy attending, too. It is highly customisable, so the first couple of times you set up your own event can be labour-intensive. There's no "use this template instead" option, which would be nice. It irritates me that you have to connect to Facebook to see the attendee list at an event - I didn't have a Facebook account until recently plus this is mainly about work for me, so I'd have liked the option to connect via LinkedIn too! And remember to consider what data you really need - GDPR will affect this sort of thing. Ticket sales for training and networking events - it has saved one group I work with hours of time banking dozens of cheques for £10 for event places (bonkers, I know) and made our first open-access training course a doddle to market once we had done the set up. "Quick Setup, Great for Newbies"
I used Eventbrite when I was freelancing for a client. It is very easy to setup. Took me less than 30 minutes to get an account and an event up and running. It can be linked to Paypal, if you prefer which is great. It's also easy to share the event on social media. It's great for people doing smaller size community or charity events. Not much I dislike except I found it hard to get to my event later on when I wasn't signed in. I had to do a search in my area. Much more hassle then I wanted. I needed a place other than social media for a charity event I was working on. They didn't have a website or landing page to drive people to. This was the next best thing. EB is a simple planning system providing some of the marketplaces most sought after features (creating, promoting, tracking, checking-in, analyzing). Any event you can imagine can be created in minutes. If you Customization is also available as well. EB carries with it some pretty stellar analytics and reporting capabilities that allow you to see in real time the success or downside to your event The mobile application makes checking in attendees a breeze via either scanning the printed tickets or just finding the attendees name by swiping your finger across it! Customer support is for the most part attentive and their Kbase is pretty helpful when it comes to answering most base level questions. Tech Support, Customer Service. Confirmation email should have a customizable template to allow for my organizations logo, and web links! Really easy to use and integrates well with other products. The data collection process is simple, efficient and seamless!. We had previously tried Cevent, which was both expensive and extremely cumbersome. Eventbrite has provided many of the same features without the sticker shock. We used EB for a Staff Council get together with Legislators at the State Capitol. We were able to schedule reminders to attendees as well as those who waited last minute to register. We were able to have all the information we needed about attendees and track any changes they made to their registrations in one centralized portal. "Great site to manage an event"
The clean, easy to understand interface. In my organization, we host several events per year (workshops, special tours, etc. ), and have people sign up on Eventbrite. Typically, our events are free, so this is a great way for us to manage our headcount and get an RSVP list. It is incredibly easy to create an event and customize the page. The fee that Eventbrite charges. When my organization charges for an event, we have to have a discussion about whether to build Eventbrite's fee into the charge or allow the person to pay the fee themselves. If we charge at the door as well, the person paying at the door will ultimately pay less than the person who has paid online. We'd rather people pre-buy tickets, so that's a definite drawback for us. Creating and managing a list of attendees for events has been so easy and wonderful. We can set a max capacity, or leave it open ended if we choose. "Great platform, not the best for organic search"
The registration process for a paid or free event is extremely simple. When I know what I'm looking for, it's easy to find. It's very difficult to search for certain types of events. Hosts seem to do a good job of classifying events, but the site doesn't filter them well and sometimes I end up with suggestions that are a three hour drive when I'm looking for something local (within 20 miles). Be ready to spend a little time getting yourself familiar with the platform if you plan to use it to browse for events. While it's fairly intuitive, it does take some getting used to. If you're planning to register for an event on the platform or create your own, it's a piece of cake. We work with students who are looking for networking events to attend in various cities around the US. The platform is helpful in opening their eyes to the variety of events that are available to them. Because they have Eventbrite, we can spend more time working on their curriculum while they are getting out in the field. "Great event management tool, short on analytics"
It's relatively easy to create and manage events, setup tracking links, print out a guest list, add guests manually, and contact registrants via e-mail pre/post event. I'd like to know which channels people are using to receive information about my events. The impressions vs. tickets sold numbers are not correlated in any way. I have to add tracking pixels for Google Analytics in order to find out where my customers are learning about my events. I'm not a Google Analytics expert. I wish I could use Eventbrite as my only event managment tool--for creating an event, for e-mail invites, and for all my analytics. Instead, while Eventbrite has an e-mail function built-in, it's difficult to work with, and the e-mail text doesn't render as expected. To get the best analytics, I have to look to Google Analytics to get the data I want to know where I should be promoting my events the most. I want to know the point of entry where people are coming from to register for my events. I wish Eventbrite could tell me that, based on the tracking links I use. My previous content management system handled events and e-mail invites, but the e-mails could not be scheduled--multiple e-mails could be setup, but the date/time of the e-mail could not be updated, it simply posted at the time of the event, a week before, day before, etc. I also couldn't limit attendance (in the case where there are space restrictions). Now I can choose when my events go LIVE, I can limit attendance, and I can schedule when my e-mail invites go out (using Mailchimp), and sync my guest lists with my e-mail list. "I use Eventbrite to find networking events." As a user I find Eventbrite easy to use. I love the Eventbrite mobile app. and it has made it easy to save my event tickets to my digital wallet,without the need to go around with a printed paper.I love the variety of events available on Eventbrite ,I have been able to find and register for local meetups,tech events ,hackathons etc thus there is always an event that fits my current interest on Eventbrite. Nothing to dislike about Eventbrite really. Except that as a user,it takes time to find my events of choice .Will be great if Eventbrite can have a recommender algorithm in place ,which will use data of past events I have attended ,to recommend similar events to me in future. I leverage on Evetbrite to find local events happening around my city,where I can network and meet with like minded people.